These various posts point to the gross flaws in Levy’s understanding about what faculty do, about how we have to spend our time, about how much time it takes to teach and carry our our other tasks. They draw on experience from a range of institutions, from teaching-heavy colleges to R-1 universities. As these posts indicate, Levy is wrong on every point and for every type of institution. California’s CSU system has lost approximately $1 billion in state funding over the past 4 years. Consequently, the system is going to close admissions for many of its 23 campuses for the Spring 2013 semester, denying admission to nearly 16,000 students, and will wait-list all students applying for the 2013-2014 academic year. If Governor Brown’s proposed budget initiative to increase taxes is defeated, an additional 20,000-25,000 students will be denied admissions. California might be an extreme example, but it is not unique: Higher Education Vanishing Before Our Eyes. In his recent Op-Ed in the Washington Post , “Do College Professors Work Hard Enough?” David Levy parrots banal misconceptions about what is required of college faculty and how those faculty spend their time. He reduces a faculty career to teaching and assumes that teaching is nothing more than the hours spent in the classroom and an equivalent number of hours prepping for those in-class performances. He then blames faculty salaries for the rising cost in tuition. Levy is wrong about faculty requirements, wrong about the time spent teaching, and wrong about faculty salaries causing the rise in tuition. Typically, faculty are required to apportion their time across three areas: teaching, service, scholarship. When teaching, faculty requirements include preparing courses, class preparation, actual in-class teaching, office hours, additional meetings with students, grading, freshman advising, major advising, and senior thesis advising. Under service, faculty requirements include departmental meetings, standing committee meetings, ad-hoc committee meetings, faculty meetings, and the paperwork and administrative work associated with a functioning department and college. For research, faculty requirements include doing research, writing up that research in the form of conference presentations, going to conferences and giving those presentations, writing up that research in the form of grant applications, writing up that research in the form of articles and books, and reviewing other grant applications, book and article manuscripts, and external personnel cases. Clearly, faculty are doing more than just teaching. But even in that teaching category Levy is grossly mistaken about what faculty do and how long it takes. Class preparation and in-class teaching are only a small part of the time and effort required of faculty. There is no easy way to quantify the various categories, but some broad estimates would be: for every in-class hour faculty often spend 2+ hours preparing. So, using his estimated time in the classroom, if we are teaching 12-15 hours per week, we spend another 24-30 hours preparing for class. Add to that the mandatory office hours and extraordinary meetings with students, typically 4-5 hours per week. Add to that advising of various sorts, 2-3 hours per week. Add to that grading, which averages out to about 3-5 hours per week. Some weeks require more time, others less. The teaching requirements range from 45 to 58 hours per week. As for faculty salaries causing the rise in tuition, Levy is either being deceitful or is woefully ignorant. Increases in tuition owe more to falling public support for higher education over the past decades and to rising administrative costs: administrative salaries have risen considerably as has the size of the typical college administration. There are more people in administration making considerably more money now than ever before. Faculty salaries, by contrast, have risen much more slowly. Despite what he seems to think, faculty salaries are rarely “commensurate with their hard-earned credentials” and certainly haven’t kept pace with the salaries of people whose credentials did not take as long or as much effort to acquire. What makes Levy’s op-ed so frightening is the fact that as president of the Cambridge Information Group he will appear to have the credentials and expertise to seem reasonable to many people who are looking for scapegoats. One of the highlights of the Diet of Presburg in 1468 was a debate between two Polish astrologers, Martin Bylica and Jan Stercze. At issue was the proper interpretation of a geniture that Stercze had calculated in 1467 for János Rozgon, a Hungarian Count. Upon reviewing the geniture. Bylica declared that Stercze’s interpretation was founded on erroneous astrological principles. Stercze defended his interpretation in a series of letters to Rozgon, but the matter remained unresolved until the Diet of Presburg the following year. In front of the Hungarian king Matthias Corvinus and the rest of the Diet, Bylica and Stercze publicly debated the proper astrological techniques and the appropriate methods of interpretation. Corvinus judged the dispute and in the end declared Bylica the winner. Bylica was awarded 100 florins and, more importantly, became Corvinus’s principle astrologer and political advisor — a few years later, Bylica boasted that the king consulted with him on all important matters and rarely traveled without Bylica by his side. Stercze, by contrast, appears to have spent the remainder of his life in a small town in Transylvania. 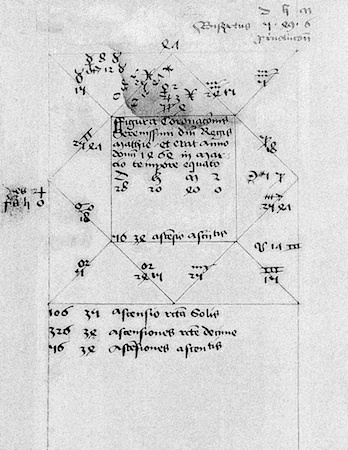 This debate provides a glimpse of the social and politic context for Renaissance astrology. The dispute between Bylica and Stercze spilled out of the erudite circles of academically-trained astrologers and into the powerful world of royal politics. The fact that their contest was an important event at the diet in 1468 locates their astrology at the center of Corvinus’s politics. It also suggests that the practice of astrology included public performance. Unlike academic disputes, which were tightly circumscribed by rules, court disputes were governed by the intellectual and aesthetic interests of the prince. To succeed in the courtly arena required erudition and showmanship. Bylica had mastered both. It is no surprise that he was handsomely rewarded with Corvinus’s generous patronage for the remainder of his life. A horoscope cast by Martin Bylica for Matthias Corvinus’s Coronation in 1464. 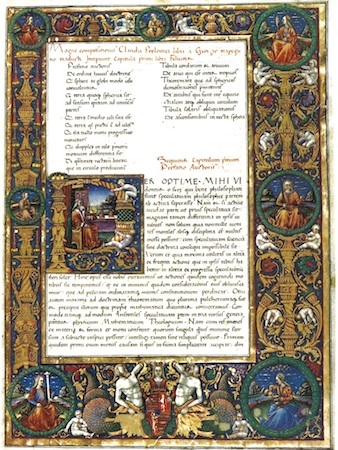 In 1498 Giorgio Valla published a Latin excerpt from Nicephorus Gregoras’s treatise “On the Construction and Origin of the Astrolabe.” Despite appearing as the fifth tract in Valla’s compendium, which included other Byzantine and Greek authors, Gregoras’s text quickly became a standard authority amongst scholars in 16th-century Europe. 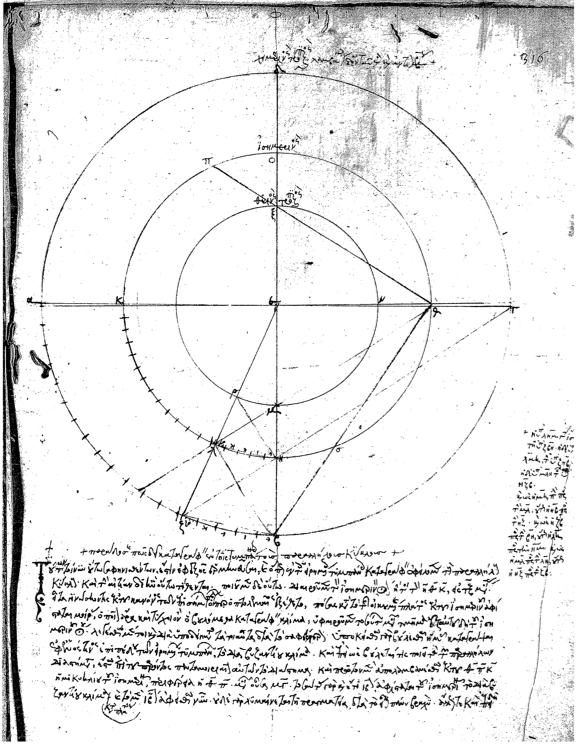 Authors such as Johannes Schöner and Peter Apian regularly cited him at various places in their own manuals on constructing and using astrolabes but do not appear to have read Gregoras’s text. Indeed, their familiarity with the Byzantine scholar seems to have been mediated through Valla’s excerpt. This project has two parts. 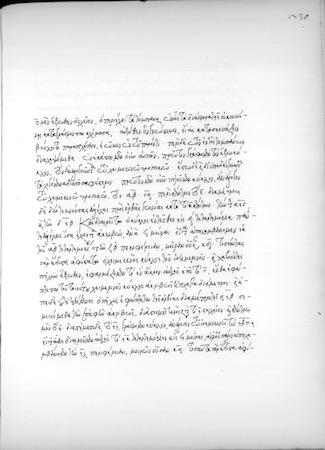 First, I am working on a critical edition and translation of Gregoras’s text. This volume will include a scholarly introduction that locates Gregoras and his work within the Byzantine tradition. The second part of the project explores how and why Gregoras became an authority for 16th-century Latin authors. This promises to illuminate how Byzantium came to occupy a place of intellectual and cultural importance in the sixteenth century, particularly amongst German scholars and humanists. In March I am talking on the Byzantine polymath Nikephoros Gregoras and his efforts to establish his scientific authority. 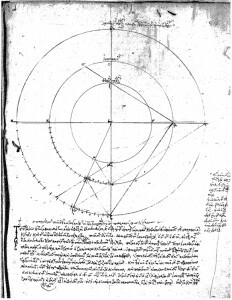 In “Empiricism, Prediction, and Instruments: The Creation of Expertise in 14th-Century Constantinople” I will examine the ways that Gregoras tried to distinguish his own expertise by grounding it in precise, empirical predictions and his command of technical knowledge. This talk forms part of my larger project on Byzantine scientific knowledge. This larger project began from Gregoras’s text “On the Construction and Origin of the Astrolabe” (“Περὶ κατασκευαζῆς καὶ γενἐσεως ἀστρολάβου”). 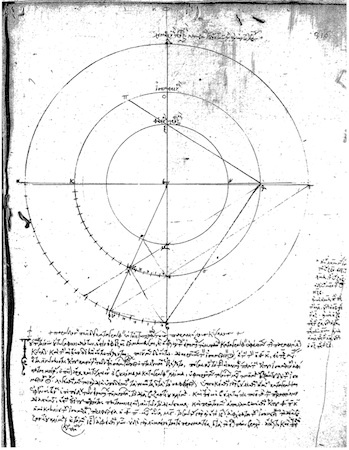 A digram from Gregoras’s text on how to construct an astrolabe.